Democratic primary voters think former Secretary of State Hillary Clinton, not Sen. Bernie Sanders, is the candidate more likely to bring about change if elected president, according to a new CBS News/ New York Times poll. 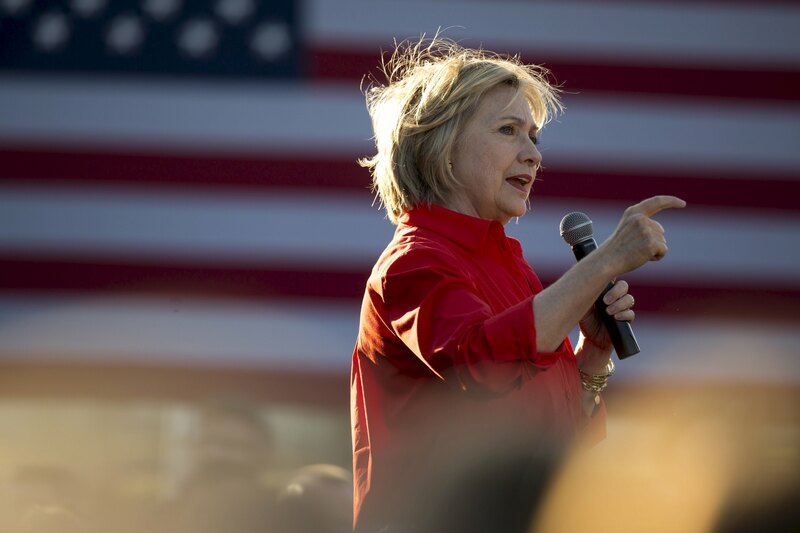 Sixty-two percent of Democratic primary voters think Clinton, the current Democratic front runner who served in the Obama administration for four years, could bring about real change in the way things are done in Washington. Fifty-one percent half think Sanders could do the same. The nationwide poll, conducted November 6-10, finds that Democratic primary voters overwhelmingly approve of President Obama, and six in 10 want to see the Democratic nominee continue his policies. At the same time, a plurality of Democratic primary voters (25 percent) think that bringing about needed change is the most important candidate quality from a list of five. Being honest and trustworthy is a close second (22 percent), followed by strong leadership (19 percent), the right experience (15 percent), and caring about people like me (14 percent). More specifically, Democratic primary voters think Clinton is the candidate who is more likely to get her policies enacted if she were elected president. Though majorities think both Clinton and Sanders are at least somewhat likely to get their policies enacted, more think Clinton is very likely. But Sanders is more likely to be seen as the candidate who says what he believes; he has a 10 point advantage over Clinton on this measure (62 percent to 52 percent) - though most Democratic primary voters think both candidates say what they believe rather than what people want to hear. Sanders is also seen as less beholden to special interests. Eighty-four percent of Democratic primary voters think special interests have at least some influence on Hillary Clinton, including a third who think they have a lot of influence. In contrast, just 13 percent of Democratic primary voters think special interests have a lot influence on Sanders. Few Democratic primary voters think either candidate would raise their taxes: Just 30 percent said Clinton would raise taxes "on people like you," while 34 percent said so about Sanders. Democratic primary voters are more confident in Clinton than Sanders on a number of specific issues. Fifty-three percent of Democratic primary voters are very confident in Clinton's ability to handle an international crisis, compared with just 16 percent who are very confident in Sanders' ability. They are also more likely to be very confident in Clinton's ability to make the right decisions about gun laws and the economy. The two candidates are about even on regulating banks and financial institutions, while slightly more voters are very confident in Sanders when it comes to reducing the gap between the rich and poor. Still, majorities of Democratic voters are at least somewhat confident in both Sanders and Clinton in handling all of these issues. positions on the issues rather than win the general election in November. When asked which is more important in a nominee, 62 percent of Democratic voters pick issues over electability - including 55 percent of Clinton supporters and 69 percent of Sanders supporters. Just 36 percent say electability is more important; among Clinton supporters, 43 percent say so. Far and away, Clinton remains the candidate Democratic primary voters think has the best chance of winning a general election - 76 percent say she does. But which Republican presidential candidate would be the most challenging for the Democratic nominee? At this point, Democratic primary voters say it's Donald Trump: 31 percent say he would be the most difficult Republican for a Democratic nominee to beat. Ben Carson (15 percent) is a distant second, followed by Marco Rubio (13 percent) and Jeb Bush (13 percent). Both Clinton and Sanders supporters view Trump as the Republican that poses the most difficult challenge. Looking at some specific issues, 58 percent of Democratic primary voters say they would be more likely to vote for a candidate who supported stricter laws on gun sales, but they are less concerned over the issue of legalized marijuana or the death penalty. Just 29 percent of Democratic primary voters say they would be more likely to support a candidate who supports legalizing marijuana. Thirty-three percent say they would be less likely to back a candidate who supports the death penalty. In both of those cases, just over half of Democratic primary voters say it wouldn't make much difference to them. Few Democrats seem bothered by the label of socialism. While most Americans have a negative view of socialism, most Democratic primary voters - including 52 percent of Clinton's supporters and 69 percent of Sanders' backers - view socialism positively. Looking past November, Democratic primary voters overwhelmingly want a candidate who will compromise with Republicans in Congress in order to get things done, rather than stick to their positions on the issues even if it means not getting as much done. Three in four Clinton and Sanders voters alike think this is more important. Clinton and Sanders are both viewed positively overall among Democratic primary voters. However, about four in 10 has yet to form an opinion of Sanders. Among the broader electorate of registered voters nationwide, opinions of these two candidates are less positive. More voters have an unfavorable view of Clinton (48 percent) than a favorable one (35 percent), while they divide on Sanders, who is unknown to many (46 percent). There is one Democrat asked about in the poll who is viewed more positively than both Hillary Clinton and Bernie Sanders -- former President Bill Clinton. Fifty percent of voters nationwide, including three in four Democratic voters, view the former president favorably, higher than his spouse and her chief rival, Bernie Sanders. More than four in five Democratic primary voters say they are at least somewhat satisfied with the Obama presidency so far, including one in three who is very satisfied. Democratic primary voters backing Sanders for the nomination are less vigorous in their positive views of the president than those supporting Clinton. Eighty-three percent of Democratic primary voters approve of the overall job he is doing, and 80 percent approve of how he is handling the economy. Majorities approve of his handling of foreign policy (61 percent) and ISIS (54 percent). Sixty-one percent of Democratic primary voters say the country is headed in the right direction (compared to just 33 percent of Americans overall). The economy has been at the top of Americans' list of problems facing the country since 2008, although fewer volunteer it now than did so a few years ago. When asked specifically to name the most important economic problem facing the country, Americans overall choose the federal budget and government spending. But priorities among Democrats are different. Income inequality, an issue addressed by both Clinton and Sanders, rises to the top of the list, followed by jobs. Democrats express urgency about addressing income inequality as well: 86 percent think it needs to be dealt with now. Additionally, 84 percent of Democrats favor increasing taxes on the wealthy and large corporations to help reduce it. Four in 10 Democrats favor banning the sale of all handguns except those issued to law enforcement officers - something not suggested by current Democratic candidates. Fifty-eight percent oppose it. Far fewer Republicans and independents support this. Fifty-one percent of Democrats are opposed to the death penalty for those convicted of murder; just 39 percent support it. There are few differences between Democrats and others on whether the U.S. should take the lead role in in trying to solve international conflicts. More Democrats say no than yes. This poll was conducted by telephone November 6-10, 2015 among a random sample of 1,495 adults nationwide, including 1,259 registered voters. Data collection was conducted on behalf of CBS News and The New York Times by SSRS of Media, PA. Phone numbers were dialed from samples of both standard land-line and cell phones. The margin of error for the sample of 418 Democratic primary voters is 6 percentage points.